Even though Key west is famous for it's deep sea and offshore fishing, if you're the type that craves more fast paced action then Key West's light tackle sport fishing will be the perfect match for you. 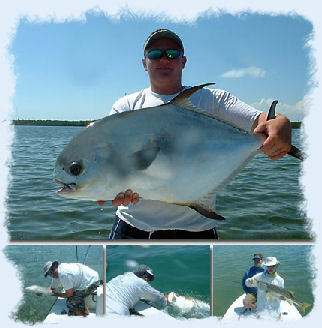 The lower Key's offers some of the best light tackle sport fishing there is. If kids are involved we certainly recommend you skip the deep sea charters and opt for one of the more action packed light tackle charters. 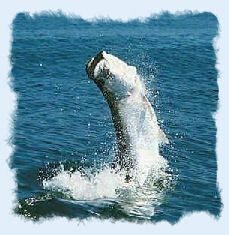 The area offers some of the best light tackle action including tarpon, bonefish, permit, snapper and the tasty grouper. Key West's reputation of world class light tackle fishing is well deserved. We have assembled a list of top notch light tackle fishing guides and charter boats that will provide you with the expertise to keep your rod bent continuously. Most of the charters will offer a 4, 6 or 8 hour rate option. 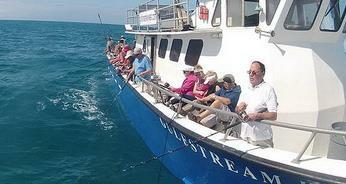 GULFSTREAM FISHING - Featuring The Most Affordable Fishing Charter in Key West! If you're looking for an affordable Key West fishing charter that won't break the bank, then search no further. 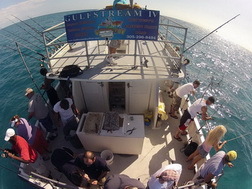 Gulfstream Fishing offers the best deal on a Key West party fishing charter that we've come across. The boat can handle up to 65 passengers but they limit their number of guest to maintain plenty of elbow room. With Gulfsteam you can spend a day fishing for a fraction of the cost of a private charter by sharing the cost with other people. Instead of spending $800 for a fishing trip you will only pay $58.50 for a 6 hour excursion if you book on line with them. The Most Affordable Light Tackle Fishing in Key West! Kids ages 12 and under also receive a special deal at $38 (if booked on line) and children ages 5 or less are $24 with special equipment provided. Jut because you'll receive a great bargain don't assume for a second you won't get the same first class treatment the expensive charter boats provide. The crew of the Gulfstream has an excellent reputation for treating their guests with first class care. Their boat the spacious 58" Gulfstream IV, comes with a large galley with an ample food and beverage menu with very reasonable pricing. The Gulfstream IV departs the dock each day at 10:00 am and returns to port at 4:00 pm. We highly recommend them for a fast paced day of fishing action at an affordable price. They are located at the Historic Charter Boat Row. Purchase your Florida Fishing License online here. Located at the Historic Charter Boat Row, just a short drive from our vacation condo rental. The Booya I & II vessels are state of the art '09 SeaVee's with center consoles and heads. They not only specialize in light tackle fishing, they also offer deep sea guiding, deep drop angling, bottom fishing, and trolling. They have a reputation for only using top notch equipment for the different types of fish they pursue. Let Captain Pat decide for you what your catch of the day will be and you will almost guaranteed to put you on the action. They pursue all the different species of fish in the Keys. Call Capt. Pat, he'll get you hooked up with a fishing trip of a life time. Delph Charters is a full service charter service that features a wide range of world class angling possibilities. They offer reef, wreck, deep drop, flats, kite, Fly, bluewater, and live bait fishing. They pursue all of the most popular game species to be found in the area surrounding the Keys. They can provide you with a great day of hard hitting action! They will let you plan the day and they will do their absolute best to make it happen. All top end gear and licenses provided with a wide range of sporting options available including deep sea, light tackle, wreck, and shallow water angling, and more. They encourage you to bring your whole family for a great day in the sun! to increase your odds of catching fish. They offer reef, wreck, deep sea, flats and back country angling. Their boat the Incognito is a thiry foot Contender-center console fully equipped for fly and light tackle. You will need to bring the food, drinks, camera and sunscreen they will provide the rest including the ice. Located just a short distance from our Key West condo rental property is Key Limey Charters. 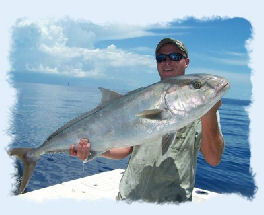 Captain Tony specializes in either deep sea or Flats angling with an emphasis on Fly Fishing. Tony has a tremendous twenty year track record with a back ground in commercial angling with rod & reel. They will supply everything but the food and drinks. Join Captain Mark Baumgarten on your next outdoor adventure in the Florida Keys. Mark uses nothing but state of the art equipment including his 36 foot Hatteras boat that has many of the comforts of home. Cowboy Charters gives you the option for a private charter or you can share the cost with a shared fishing trip with another group. Cowboy Charters offers full day, 3/4 day or 1/2 day charters depending on your budget. Key West Pro Guides features over twenty Owner Operated Charters to choose from! They are reputable full time pro guides each with many years of guiding experience in the Keys. They have many testimonials as to their success and dedication to their customers. This is what Key West charter boat excursions are supposed be like! Captain Jake is a Key West native with years of experience in guiding in the Keys. Capt. Jake is also a long time scuba diver which also gives him a great advantage over his fellow guides when it comes to secret hotspots. Choose from deep sea, reef, wreck, or offshore angling. For those of you interested in catching the ocean's tastiest inhabitant, Capt. Jake also specializes in catching lobsters. Come experience the best in Florida Keys angling for yourself! Odyssea invites you come experience a taste of what real Caribbean algling is all about. They will offer you an excellent chance to catch the whopper of your dreams. Odyssea offers trips for any species worth catching in the Florida Keys including any offshore or inshore species. 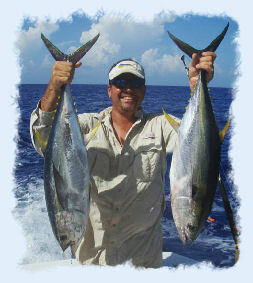 Skipper Rush Maltz has a life time of guiding experience in the waters of Key West! OFF THE ROCK CHARTERS - Featuring Captain Brad! Captain Brad is another Key West native who has a lifetime of knowledge on guiding on the local waters of the lower Keys. Brad grew up spending almost every day on the water whether it was catching fish or scuba diving. They offer a variety of options besides light tackle and have an enclosed bathroom for the ladies. Custom trips are available. Join Captain Bennett Taylor for an excursion aboard the Outer Limits, a specialty crafted forty one foot yacht, which features air cond., roomy and comfortable salon, working head, fighting chair and generous fly bridge area. Skipper Bennett's specialty is the highly sought after Sailfish using live bait. They will do what it takes to give you the best opportunities to catch trophy fish with room for up to six anglers. Custom trips available upon request! There is no other location on earth that provides you with the multitude of angling options that Key West can provide you! 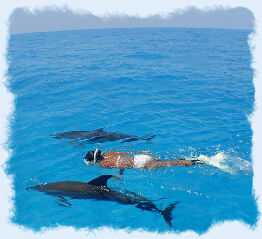 Captain Pepe takes advantage of those options and provides a wide array of custom trips to suit your individual tastes. Whether it's deep sea angling, light tackle or on the flats, Captain Pepe does it all. Growing up in Key West has given him the edge to insure you a successful voyage. when it comes to light tackle excursions on and around the waters of Key West. Captain Steve is yet another Key West born and raised guides. Steve started with a commercial background at the age of sixteen and also specializes in spearing both of which have given him the inside track when it comes to fish behavior and patterns. They offer a variety of angling choices besides light tackle and feature the latest in electronics gear. They are located at the Murray Marina. Captain Paul Tryon is a member of the Florida Guides Assoc. and has been featured on ESPN and the Outdoor Life TV shows. Paul's forte is light tackle guiding but they offer a full array of charters for you to choose from. Paul is a great guy and has many thousands of satisfied clients to prove it! They take on only private trips to further add to your enjoyment. TRIPLE J CHARTERS - Light Tackle is their Game! Captain Jason specializes in the exciting guide technique of using light tackle. He also is a native of Key West. Capt. Jason honed his skills in the commercial fisheries industry at a very early age and he spends an average of over 300 days on the water each year. That's a lot fishing. Jason will pursue any species you wish to catch and will tailor your charter to fit the time and conditions for your best chance for success. Capt. Jason guarantees that if you do not catch fish or if you are not completely satisfied with your trip, the charter is free! 1800 Atlantic Condominiums - Key West's Premier 2 & 3 Bedroom Vacation Rental Suites on the Ocean! Info on - Key West's Finest Vacation Rentals - located on the Beach!